Inside Storey: Rachel Holcomb: What Will I Eat? Rachel Holcomb: What Will I Eat? As the realization that I will once again be stuck in classes all day starts to settle in, I begin to think about all the things I need to do to be prepared. There is the buying of pens and notebooks, back-to-school clothing, and then the big deal, Food. What will I eat, when will I eat, will I eat on-campus meals or cook mostly for myself? The older I get the more I like knowing where my food comes from and how it’s prepared; I prefer to do it all myself so I don’t have any lingering questions. That rules out school food and fast food. But it takes time and planning to be able to cook for myself. As it nears the end of the week and my cupboards are empty, I am forced to start planning out the meals for the next week. I don’t really want to go grocery shopping, but ordering out is expensive, and I never really know what is in the food I’m eating. Conveniently, though, the grocery stores put their weekly circulars online so I can see what is on sale before I even get there. I can make a list, plan out my food for the week, and make sure I stay within my budget. Also, I’ve started shopping at the farmers’ markets regularly. The locally grown food is so much cheaper than grocery store produce. It’s actually less expensive to buy the veggies for salad there than it is to get one from any fast food place, and you end up with more salad when you buy the veggies yourself — like Bok Choy Salad, a recipe I found in the Healthy College Cookbook, which has a homemade dressing and a crunchy topping that is just delicious (see recipe below). It is so much more practical to buy the few ingredients necessary, and it makes a huge salad! Besides, having a list keeps me from impulse shopping and buying random things that I don’t really need. So yeah, there is a lot more to grocery shopping than just going, grabbing food, and buying it. Because bok choy is a mild member of the cabbage family, this salad is a nice cross between a green salad and cole slaw. 2. Separate the bok choy leaves, cutting off the thickest part of the stem. Wash thoroughly and dry. Chop the stems and leaves into bite-size pieces. Toss the bok choy and onions in a large bowl. 3. Place the sunflower seeds, almonds, and noodles in a separate bowl. Pour butter over the mixture; blend well. Transfer the mixture to a baking sheet and bake for 3 to 5 minutes. Watch closely; stir after 2 minutes. 4. Pour the soy sauce, vinegar, oil, and sugar into a jar with a tight-fitting lid. Shake thoroughly to blend. 5. Toss the dressing to taste with the bok choy and onions. Let sit for at least 10 minutes before serving. When you are ready to eat, sprinkle the seed mixture over the salad and serve. 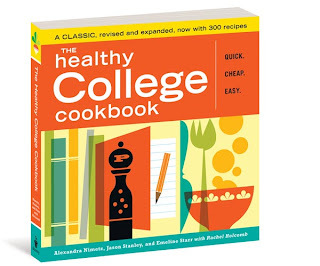 Rachel Holcomb, a student at the University of Massachusetts, has selected 100 new recipes, submitted by busy college students with limited budgets.